Who wants to be the authority on culture and heritage in our land? For those interested, Hema Nalin Karunaratne is set to floor the gas pedal with his Heritage TV channel on Dialog TV - available free of charge 24/7. Following his trails along the hallways of Rupavahini and Swarnavahini for quarter of a century, Nalin now heads a satellite channel, a meeting place for culture and nature. Heritage TV has been broadcast on Sri TV since September, 2008 two hours a day. “I believe we have a robust heritage that the world should learn, study and research. So my foremost aim was to build up a channel thoroughly focused on our heritage. We are now in the process of creating a world audience for Sri Lankan programmes by using more and more foreign languages. We should tell specifically the Western world what Sri Lanka is.” started off Nalin in a voice thickened with firm resolution. The channel was officially launched on May 31 at the BMICH with the distinguished participation of Speaker W J M Lokubandara, Culture Minister Mahinda Yapa Abeywardena, Media Minister Lakshman Yapa Abeywardena, Western Provincial Council Minister Udaya Prabath Gammanpila, Youth affairs Minister Pavithra Wanniarachchi, former Sri Lanka Rupavahini Corporation Chairman Professor Tissa Kariyawasam and Dialog TV Chief Nushard Perera. Nalin was a lad full of spirit when he left Royal College in 1980. 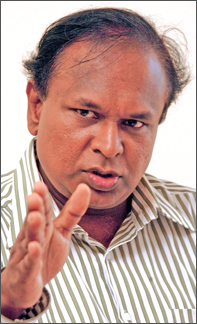 He headed many a college functions such as debating team, Sinhala Association and Health Club. Nalin chose science stream for A/Ls, but still his heart went for Arts. He was still occupied with the college’s arts scene for the next two years, until he stepped into Rupavahini as an Assistant Producer when legendary M J Perera held the Chairman’s office. Rupavahini molded the monumental design of Hema Nalin’s career. Nalin introduced the way of the art to announcing, which was quick, witty and original. When the way the many elders passed down the knowledge bored the younger generation, Nalin made it animated. Rupavahini’s education service was a milepost in his life. He was only to see his future with 9.05 fame and the variety of others tagging along him in both Rupavahini and Swarnavahini. Ever since his childhood, Nalin has been fond of travelling. Today he is a much travelled man both at home and abroad. Even for university dissertations, he used to present the documentary programmes he produced. Why a special channel for documentaries, when the normal channels have allocated a particular airtime? Nalin is determined to make his Heritage TV the local Discovery model one day. But he has other issues too. Marketability is such one. He however has realised the lack of documentary producers, which made him think up of a training institute too. What else have you got in your mind? No, that’s not at all. Still more to go. Following all these, Nalin sets sights on a monthly - or perhaps a tri-monthly - magazine containing what was telecast on the channel. When he left his last workplace Swarnavahini, Nalin had no specific idea on what is in store for him. “I wanted more freedom to do what I am trained in - the documentaries. I worked at Rupavahini for 16 years and then at Swarnavahini till March, 2008. Hema Nalin Karunaratne was more known as a presenter. However in future he will be the backseat man of many documentaries we watch on Dialog TV. Nalin lives with his wife Dr Iresha Karunaratne and daughter Nalini.